Our first thought was – simply put up posters in your building, fix a time and ask people to donate clothes at your place and then drop the collections at an NGO. But thankfully before we gave voice to that, we asked how many people were they expecting to donate? Their response “There are 25 apartment buildings in the complex and each building have 52 flats. Assuming even a 25% contribution, we expect at least 300 households to contribute”. Huge number for our first thought :). We asked for a day and then prepared this document with certain basic steps. There are obviously no hard and fast steps to How to organize a clothes/ books/ toys collection drive; but these steps may help as reference. Identify charity organisations in your city where you can donate the clothes. Depending on the number of contributions you expect, find at least 3-4 NGOs. Ask the NGOs if they need any specific kind of clothing such as children’s clothing or blankets, or if they do not accept certain specific clothing for example inner or undergarments (unless new). You need to include this information in your publicity for the drive. Also ask if they can pick up the donations. Identify a drop-off/ collection location. It may be the office of your apartment complex, a garage portion or your own home or multiple homes say one house between every 2-3 apartment buildings. Decide on the days for collection. Give your members at least a week to sort and collect clothes for donation. Create flyers and email with information on kind of clothing; drop off location; dates; times and details of a person of contact in case people have any doubts. It is also good to add that the clothes should be clean and in wearable condition. Minor tear is fine, but remember that someone is going to wear them. You might also want to ask people to give old packing boxes. Spread the word in as many ways as possible. Send the email to all residents (usually the office will have an email group for all residents); distribute flyers, put up the flyers at the entrance of apartment buildings and other notice boards. Sort the donations as soon as you receive them or as regularly as possible so that it doesn’t just keep piling up. For example you can sort into children’s clothes, adult female, adult male and misc (misc may have blankets, socks, bed sheets etc); or you may sort according to what different NGOs have asked for; or according to seasons. Collect packing boxes and bags and pack all the donations. Ask more volunteers to help you with sorting and packing. If you need to drop off the donations, hire a van or use your personal vehicles and drop the boxes to the identified NGOs! Send a thank you email to all residents, including details of how much was collected and how many NGOs (and people) their donations will help. 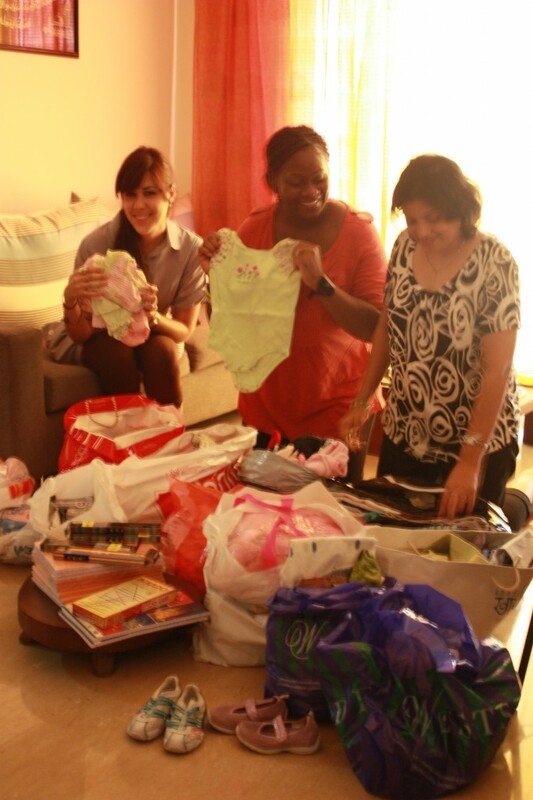 We loved how a fellow blogger Sumedha Sobti says that “When you want something, all the universe conspires in helping you to achieve it”; on her experience of organizing a clothes collection drive in her colony. And the lovely thank you cards she made for the contributors. Do you have tips on organizing clothes or books or other collection drives in a community? Do share so that we can all benefit. We can help you in identifying charitable organisations that accept donations in some cities. Do contact us with your city details if you want to organize such a drive. 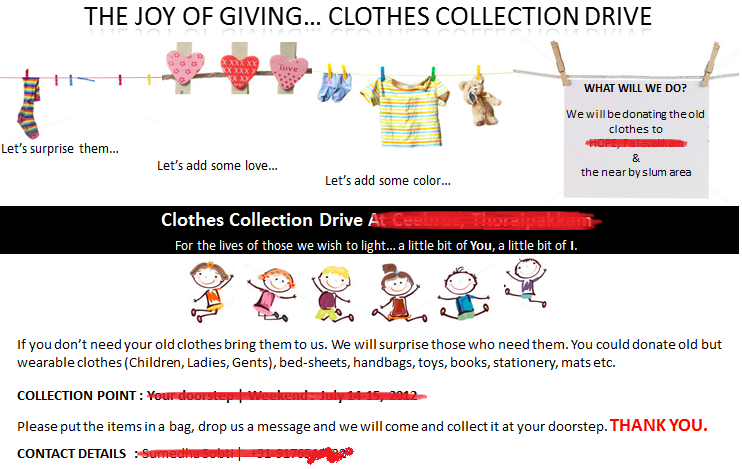 2 Responses to "How to organize a clothes collection drive"
Can you guys help me find an NGO in Mumbai that supports sports, as I plan to organize a collection drive for gently used sports gear/equipment that can be donated. Firstly I am extremely sorry for such a late response for your query. The blog was dormant for almost a year because of a multitude of reasons. Do you know about magic bus (https://www.magicbus.org/) they support sports with kids from the slums. Also many NGOs working in slums will be able to use your sports donations with their children even if they don’t explicitly support sports.